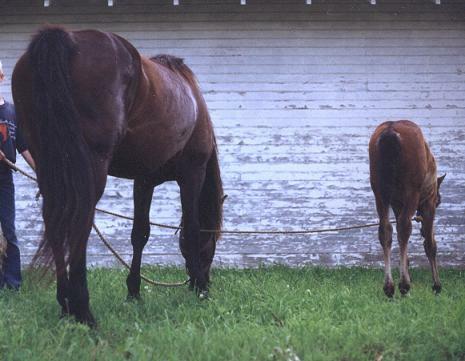 Has there ever been any doubt that mares are the heart of a breeding program? They contain 50% of the genetic make up of a herd. That 50% is really quite a bit and has the potential to make or break any breeding program. 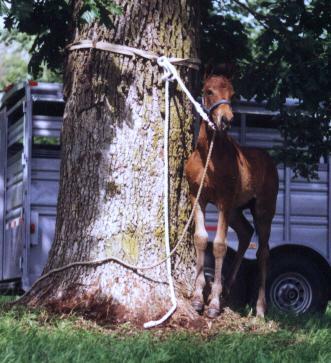 It is for this reason, that all of our mares must prove their worth as "using/working" horses first. 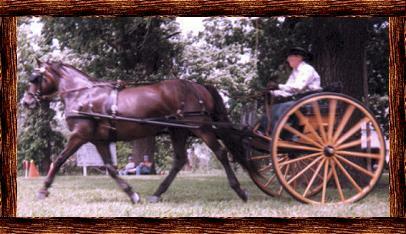 Then and only then may they earn the "right", coupled with pedigree, to be considered a Kansas Bluestem Broodmare. 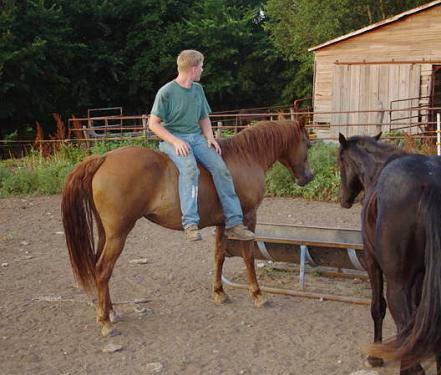 Our mares at Kansas Bluestem Morgans consists of good old Midwest Foundation Morgan lines that are basically cut from the same cloth. All of our lines go back to the Herod line. An old line known for being both bold and kind. 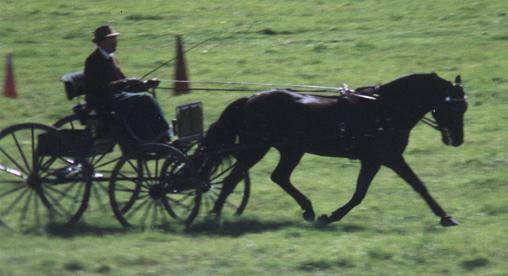 All of the mares with the exception of one originate from or are closely related to Sweet's breeding. 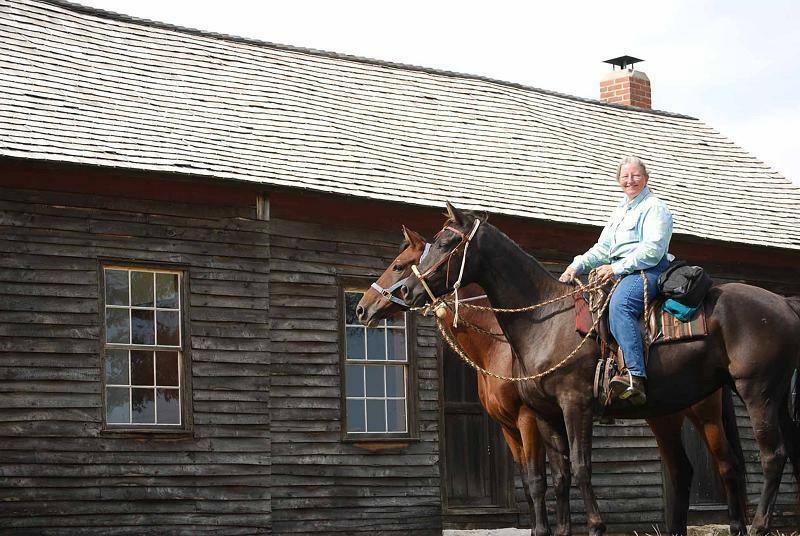 The late Harry and Mabel Sweet along with their daughter Georgia (D's prefix) raised old Midwest Foundation ranch Morgans for many years in Jewell, Kansas. 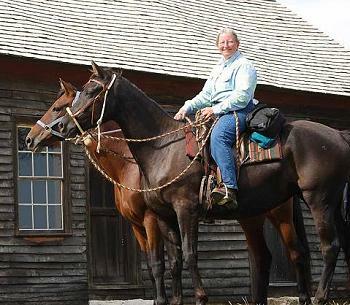 Harry routinely used his stallions to work cattle at the local sale barn. 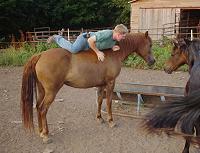 The Sweet's line of horses are extremely athletic individuals that are level headed and easy to train. Needless to say, this line has won both our respect and our hearts. So much so, that we have no desire to find or even experiment with another mare line. That alone in one sentence sums up what we feel about this line of mares. Our mares traditionally represent themselves as big, calm, honest working horses. 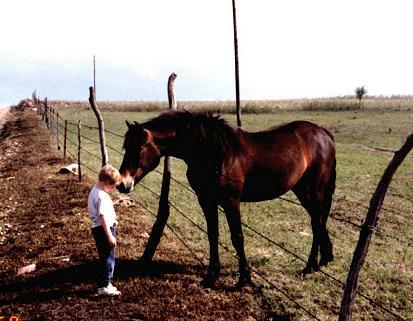 She was a large mare, 15.1 ½, dark bay, and very kind.. 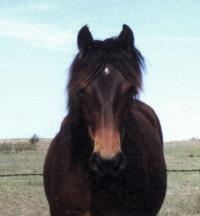 Bred by Harry and Mabel Sweet and then purchased as a yearling by Kent Burch, of Burchtree Morgans, Roxbury, Kansas. 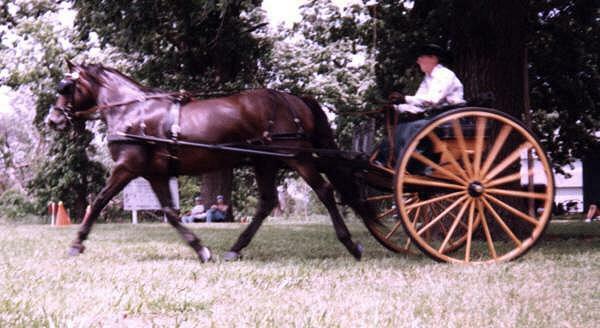 Kent used Tonga as his personal cow horse. 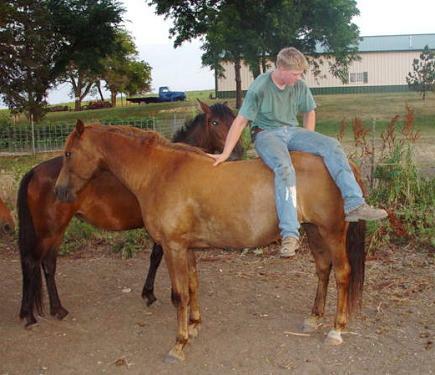 Kent will always reminisce and say Tonga was his greatest horse. He once told me "She was an extremely athletic cow horse, one of his best, and she had never been beaten in a race, trotting or galloping. The other horses just did not have a chance." We purchased Tonga from Kent in her later years. 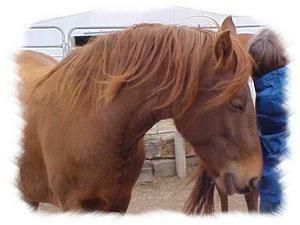 She was a kind, gentle mare that just commanded "respect". 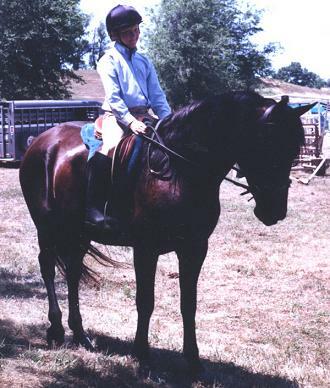 She was a mare of great endurance, much like her full brother Sweet's Shamrock, of whom was ridden cross country from Kansas to Baltimore, MD; a total of 1350 miles. 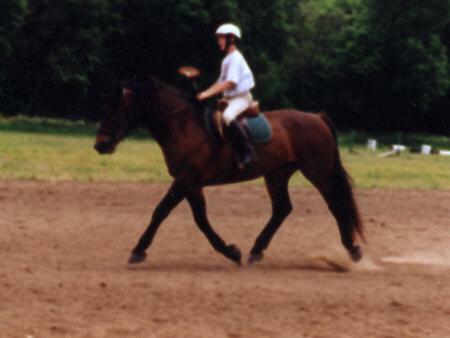 In addition to her great athleticism she was also a very productive mare. 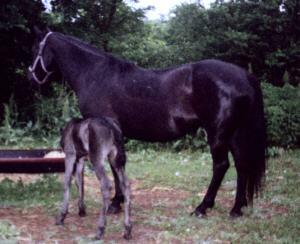 She had a total of seventeen foals in her lifetime. For sure a record number and a testimony to her productivity. We were fortunate enough to have owned ten of Tonga's offspring, all full siblings. We still have six and the last six will remain with us until they die. 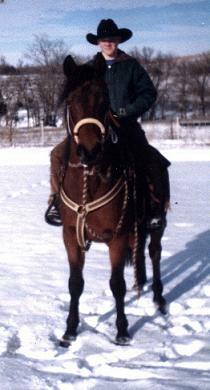 She was truly a royal mare and will always be in our hearts. Her legacy, along with the legacy of her former breeders, Harry and Mabel Sweet, will live on with us through her daughters. Sweet's Tonga; no doubt a noble mare of old Midwestern Foundation bloodlines. A rare gem. and currently still own 6. All 10 are full siblings (WAR Justin x Sweet's Tonga). 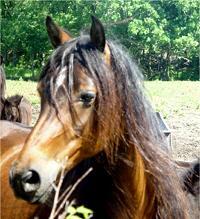 Roxanne is the eldest of our mares out of Sweet's Tonga. The cross of WAR Justin X Sweet's Tonga just enriches the old Midwestern Foundation pedigree further bringing in more of the Herod line through Winterset and Archie O, and carrying such horses as Western Mansfield, Senator Graham, Techachapi Allen, Headlight Morgan, Jubilee King, The Admiral and others. 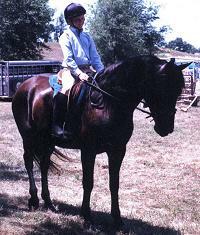 Roxanne is a lovely bay mare of good size,15.1, has nice prominent withers, large bone and lots of substance. 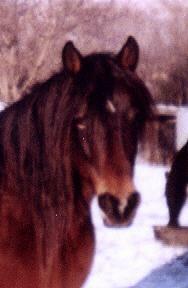 She is a very sensible mare that has an excellent mind and the disposition of a saint. 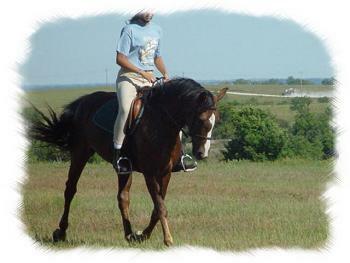 She is ridden and driven by everyone in the family to include children and has inherited that powerful hip that is the driving force for that rolling cross country trot that these horses are known for. In many ways this mare has always been my favorite mare. I have tried to find fault with her, but I can not. All I can say is she is just outstanding. I will site one example of what one can expect out of this mare. 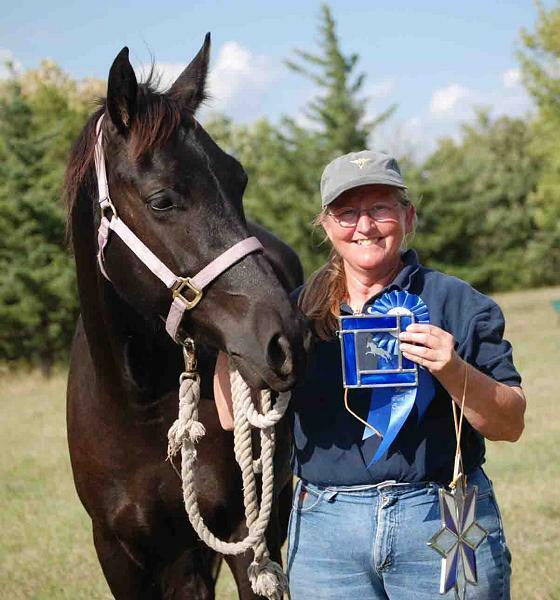 Just four weeks after the birth of her first foal and bred back again in foal, Roxanne, was entered in the Eastern Nebraska Combined Driving Event. 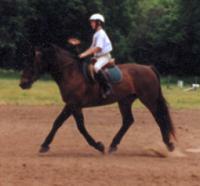 This event included a dressage test, cones course and marathon. Roxanne gave it all, she did whatever we asked, whenever we asked and her foal, just like Mom, was perfectly behaved and stood tied quietly and patiently waiting for Mom in between events. Needless to say the behavior of both mare and four week old foal were both a credit to the Morgan breed. 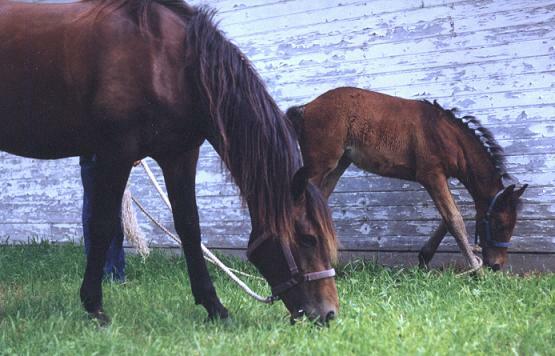 Believe me, the ultimate test of the honesty and dedication of a mare is to request work of her when a young foal is by her side. She must do two things, trust you enough to put the care of her foal in your hands, and then get down to business and work her heart out. To sum it up short and sweet Roxanne has it all, she does it all, and always gives 100%, no questions asked. 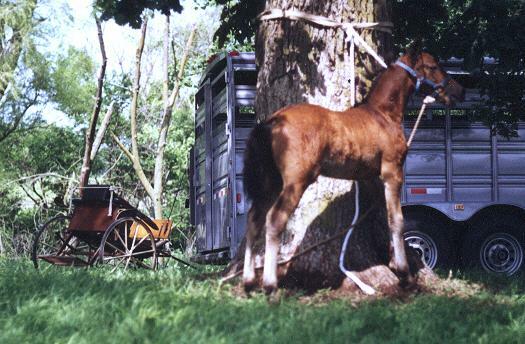 The following photo's depict Roxanne and her 4 week old foal at the Eastern Nebraska Combined Driving event. 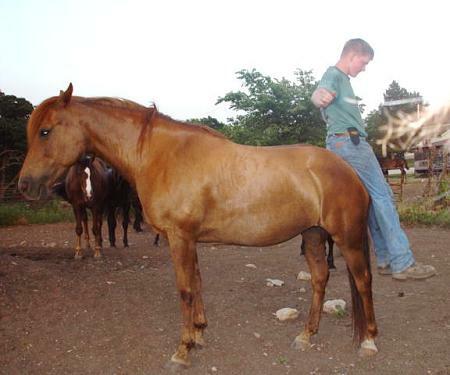 The pictures will tell the story of the dedication of this mare. Even with her 4 week old foal by her side and in a strange place she was willing to place the care of her foal in our hands and then go out and work her heart out giving 100%. This, no doubt, is the ultimate test of a mare in my books. 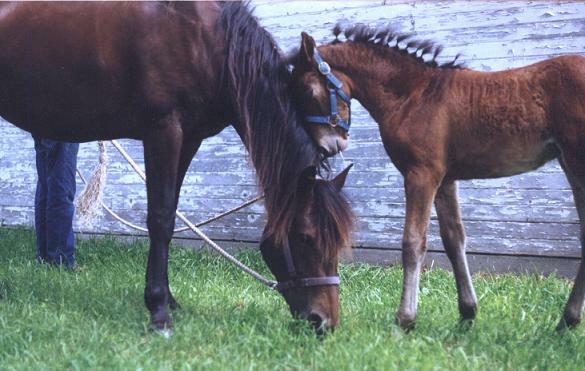 "Roxanne gives her full attention and heart while her young foal waits." Sunflower Girl, 4 weeks of age, waits for Mom. "If I do what Mom does, maybe she will not leave me." "Mom, I miss you so, please don't leave." 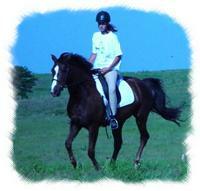 Mabel is also out of our foundation mare Sweet's Tonga. 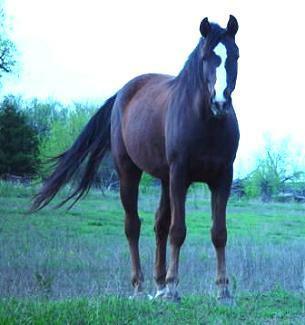 She is a beautiful mare of good size, 15.1. 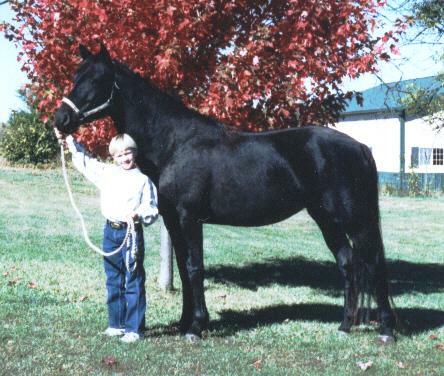 Mabel is true black in color carrying no white, she has large bone, plenty of substance , nice prominent withers and a powerful hip. Mabel has a good sensible mind and is as athletic as a cat, her athleticism just comes natural. She is one that can move from beneath you without you even knowing. 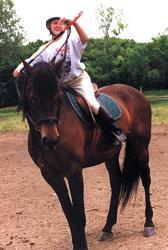 She loves to jump and has a real smooth rocking horse canter. 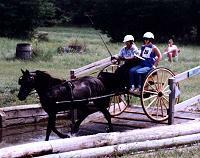 Mable rides and drives and has been used for about everything. 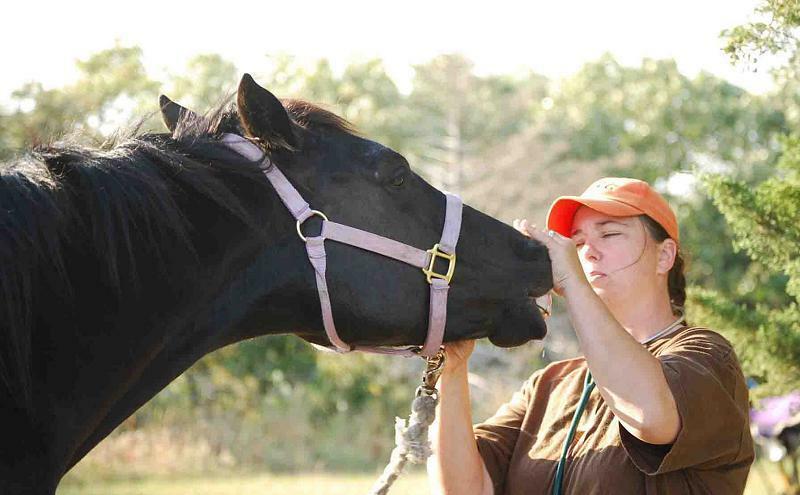 She is an all around family horse and everyone works her to include children. 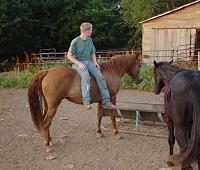 She again like her full sister Roxanne is a good honest mare that gives it all. Her first time off the farm was as at a 4-H event, she was age 6, my son age 9. 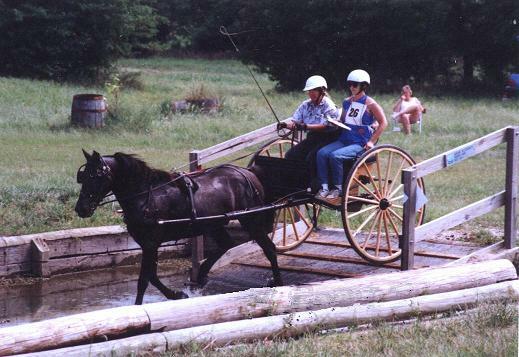 Mable was his 4-H project that year and she was just perfect. Her dedication is unquestionable. 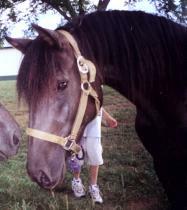 Tonga's Legacy know as "Frieda" was Sweet's Tonga's last foal and last filly. I believe the Lord was looking down and decided to gives us one last perfect "gift" from Tonga. She is another of my "favorites". Can I fault this one? No. She is my ultimate little filly. Freida, like her full sisters is of good size and is still growing. Frieda is also black has large bone, lots of substance, nice prominent withers and has inherited that powerful hip that is the driving force for that rolling, ground eating, cross country trot that this line is known for. When she trots she is just breathtaking. She just reaches, then suspends, floats and down right moves. 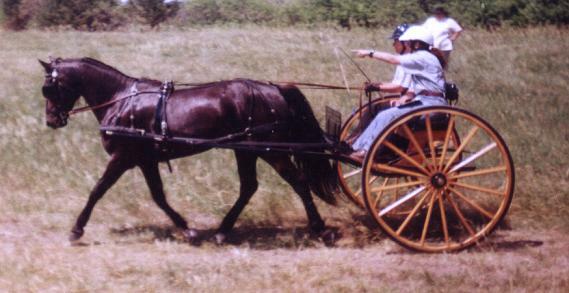 Frieda, her full sisters and all of our mares possess strong powerful ground covering trots. I have a long list of plans for our Frieda. She will not be bred for a while as she still is being "proven" and must earn her right to be a KS Bluestem broodmare. 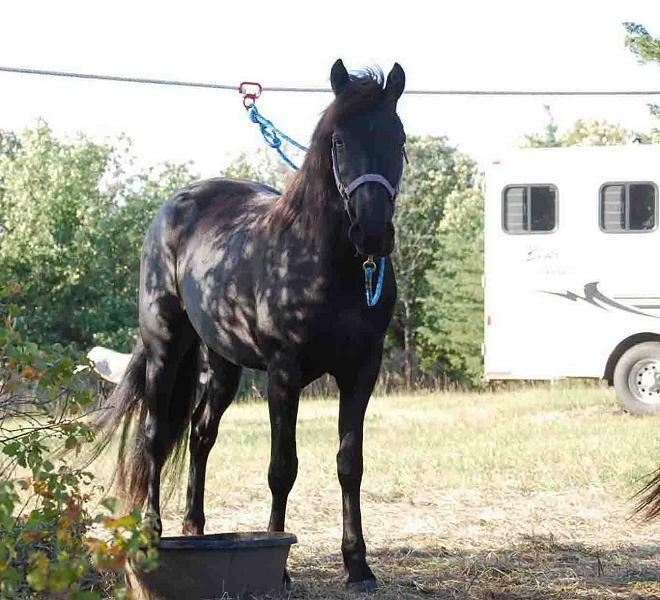 Ebony is no doubt a mare of "Royal" beauty. 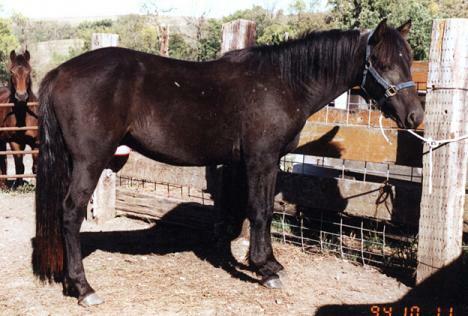 A mare true black in color and carries no white, she has excellent large bone, lots of substance and nice prominent withers. 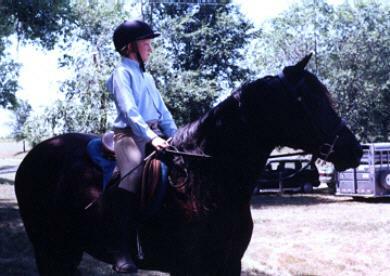 Ebony is a mare with an excellent mind and lots of sensibility, has a very nice powerful hip and a strong true trot. Her pedigree is rich in the blood of Herod and old Midwest Foundation Morgan/Remount lines. Many of Ebony's lines are the same or very much similar to our "foundation mare", Sweet's Tonga. 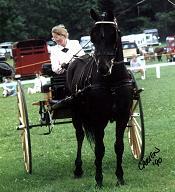 She was bred and trained by Mabel Sweet's daughter, Georgia, and carries Georgia's D's prefix. She is a mare that ever since the day I set eyes on her, I knew I wanted. I feel very fortunate and grateful to Gail Neilson of Mankato, KS for selling us "his" Ebony. Her pedigree coupled with her beauty and mind were my dream come true. We had no idea when we purchased her in the fall of the year, that in the spring, Ebony, would bless us with a beautiful little black filly. The Lord no doubt was watching. View these photos of D's Ebony Lady offspring. Yes, we consider her a "gift" from God and a true blessing. Her sire Sweet's Classy Zip is a ¾ brother to our foundation mare, Sweet's Tonga!! I thought for a long time about what to name this little filly. We decided to name her in honor of the Sweet family, and thus was named "KS Bluestem Sweet's Legacy". There is no doubt in my mind that this little filly will be a credit to her name, her breeding and her pedigree. Legacy's pedigree is extremely rich in the blood of Herod. I would venture to say that this cross may carry more Herod blood, then any other "Modern Morgan" cross today. I believe, it is for this reason that this little filly is as bold, brazen and fearless as she is. 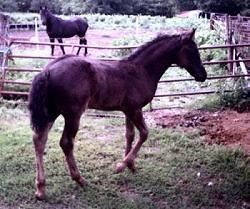 Legacy, ever since a young foal has been "worked". 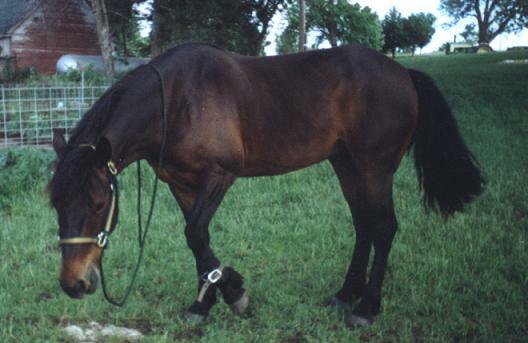 She stands tied patiently for hours at a time without fussing, line drives, side passes, backs, does a beautiful turn on the haunches or roll back and when saddled for the first time did not even seem to care. Actually, she acted like saddling was a daily routine. No surprise though, for this response was truly expected due to the amount of Herod blood that runs through this little one. Legacy carries a wonderful strong trot, good bone, excellent substance, powerful hindquarters, a nice set of withers and best of all she is as athletic as a cat. We are extremely excited about her and feel she is a true blessing from "above". In time, Legacy, after proven will be a wonderful addition to our herd. Again, I feel we were fortunate to have acquired this Sweet's mare. She has a tremendous old Foundation Morgan pedigree. 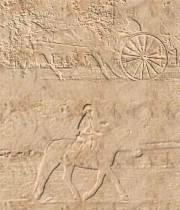 Her pedigree brings in more of the Herod line along with many other old Foundation Morgan horses of both Remount and Western Working lines. Jada Babe was one of the last horses that Georgia Sweet both rode and trained. 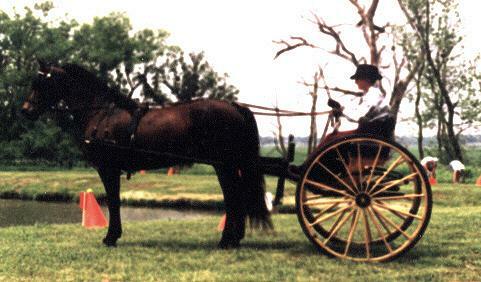 She is easy to ride and possess a very beautiful strong trot that is both reaching and suspended. She is a beautiful dark bay with a very long flowing mane and tail. She possess lots of substance, good large bone and is extremely typey. 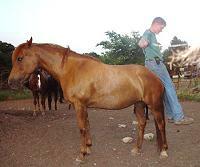 Jada Babe was bred to WAR Justin this year and we are looking forward to her foal this spring. 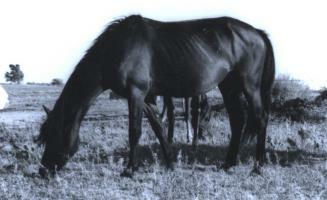 more ancestors in our mares' pedigrees. The following horses are in our mare's pedigrees, but no photos are available at this time.